The XIV Lau Haizetara Documentary Co-production Forum will take place on 25th, 26th and 27th September 2018 within the framework of the 66th San Sebastian International Film Festival. Organised by IBAIA (Asociación de Productores Audiovisuales Independientes del Pais Vasco/Association of Independent Audio-Visual Producers of the Basque Country) and the Industry department of the San Sebastian Film Festival, this forum is an ideal space in which to present documentary projects to potential funders and experts from the audiovisual and cinema sectors. 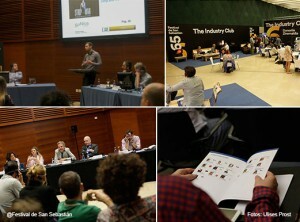 A meeting point for professionals from the audiovisual sector linked to the documentary genre. Independent producers who have a documentary project and/or are looking for a European co-production for the same, will be able to take part. The selected projects, besides presenting the project at the Pitching and having individual meetings with the Commissioning Editors, will have the chance to compete for the IBAIA prize of 3,000 euros for the producer. The Panel of Commissioning Editors, acting as the jury, will choose the winning project based on presentation, originality, treatment and dissemination potential. The deadline for the registration of projects is July, 13th.